Leviton 1-Gang Midway size toggle switch wallplate in brown color, features thermoplastic nylon construction with smooth finish. It has smooth face and rounded edges to resist dust accumulation. Rectangle wallplate measures 3.125-Inch x 4.875-Inch x 0.255-Inch. Device mountable wallplate with one toggle switch configuration, has 0.406-Inch x 0.942-Inch cutout. 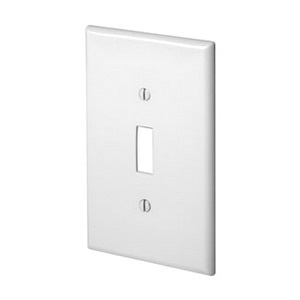 Toggle switch wallplate is UL listed and CSA certified.